The vast majority of revenue from OHA chapter banquets stays in the area it’s raised for projects and programs conducted by chapter volunteers with boots on the ground where they live and hunt. For information about recent and upcoming OHA chapter projects, click here. OHA also funds major projects at the state level each year from our Wildlife Superfund, which is funded by a 5% of net funds chapters contribute from their banquets, as well as donations from individual OHA members. Below are a few examples of recent state-level projects funded by OHA. 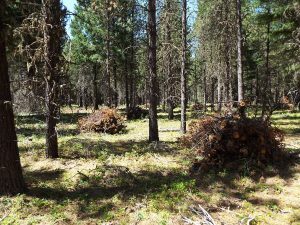 The Oregon Hunters Association grant committee allocated $10,000 to the Oregon Department of Fish and Wildlife for a wildlife forage enhancement project at Clarks Fork, near Butte Falls, and the work has now been completed. Clark’s Fork is a 6,000-acre project area of National Forest System lands designated for controlled burning use to increase early seral stage vegetation and promote health of black oak stands. This project area is key summer range for black-tailed deer and Roosevelt elk. Forage for deer and elk has declined in recent years due to reductions in logging, but this project is creating nutritious forage for big game, as well as forest grouse, turkeys and other wildlife. Initially, the project was intended to commence solely as a controlled burn, but unfavorable burning conditions led to an alteration comprised mostly of clearing brush and trees to form slash piles. Trees less than 7 inches in diameter and all shrubs were cut using chainsaws and piled. Forest Service personnel plan to burn the slash piles this winter. OHA’s contribution allowed ODFW to receive a 3-to-1 match in funds from the Pittman-Robertson Federal Aid in Wildlife Restoration Act for a total of $40,000 that was needed to complete this year’s portion of the immense habitat enhancement project. Rogue Valley and Josephine County Chapters of OHA have contributed additional financial support for the project in the amount of $2,500, each. 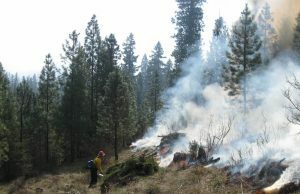 The U.S. Forest Service are responsible for fuel loading, pre and post burn maintenance and monitoring every five years after the completion of the project. The grant applicant and Denman Wildlife Area Manager for the Oregon Department of Fish and Wildlife, Vince Oredson, is optimistic about the future of the project and noted, “This area is going to produce a lot of good forage for many years.” Oredson will likely be searching for more funding in the coming years in order to apply more treatments to the 6,000-acre project area of National Forest land. 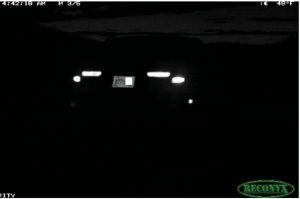 The Oregon Hunters Association grant committee has awarded $2,750 to the Oregon State Police for the purchase of specialized trail cameras that can capture license plates on moving vehicles in the dark in an effort to address chronic and acute poaching activities within the Mid-Columbia district. In a recent study by the Oregon Department of Fish and Wildlife of migrating central Oregon mule deer, research biologists discovered deer mortalities as a result of poaching approximately equal to that of predation. In the Mid-Columbia district, the practical application will apply primarily to the public lands of the Hood and White River wildlife management units where the public has vehicular access to the majority of the huntable lands. The specialized cameras that offer enhanced license plate-reading capabilities have proven to be a highly effective tool in bringing resolution to poaching cases that OSP would otherwise not be able to solve. Additionally, the cameras have already helped OSP by assisting in cases of illegal bear baiting and trespassing. Through annual reporting, OSP has identified key locations to deploy the cameras including, but not limited to the White River Wildlife Area and The City of The Dalles Municipal Watershed with chronic illegal activities for future enforcement efforts. Additional benefits from the acquisition of the cameras will be realized through the OSP Fish and Wildlife Division efforts toward hunter education and responsibility. On an annual basis, the OSP Fish and Wildlife Division provides outreach education at venues such as ODFW hunter education classes, the ODFW Youth Outdoor Day as well as the Mid-Columbia district’s youth turkey hunting clinic and youth pheasant hunts. OSP utilizes media at many of the events including their outreach trailer and an educational DVD identifying OSP enforcement activities, duties, and outreach. These trail cameras will ultimately increase efficiency and effectiveness in protecting the huntable natural resources via law enforcement. The Oregon Hunters Association has approved $15,000 for wildlife habitat restoration in the Willamette National Forest. Funds were requested by the United States Forest Service for the PineGrass Restoration Project to continue working to improve 1,600 acres of forest habitat in the Willamette National Forest that is rare for western Oregon. The Emerald Valley Chapter of the Oregon Hunters Association will donate 250 volunteer hours to the project. In addition, funds will be used to restore Johnson Meadow, a 120-acre meadow on the Calapooya Divide. The PineGrass Restoration Project lies in the upper Middle Fork Willamette River basin and consists of a mix of open forestland of large trees along with an undergrowth of native bunchgrasses. Over the years, younger stands of trees in the 20- to 40-year range have crowded in, shading out the grasses and forbs valuable for wildlife forage and increasing the danger of catastrophic wildfire. Opening up these forest areas will allow more sunlight to reach the forest floor to stimulate native grass growth while making them less likely to burn at destructively intensive levels. Thinning the PineGrass plantations and favoring ponderosa pine, sugar pine, oaks, hardwoods, and bunch grasses dramatically improves early seral conditions benefitting species like deer, elk, songbirds, upland game birds, reptiles, and a host of other wildlife that utilize this habitat condition. The second project assisted by this grant will remove conifers that have encroached into Johnson Meadow, compromising floral and faunal communities associated with high elevation meadows. Activities associated with restoration include hand-cutting encroaching conifer trees, creation of brush piles for wildlife use, prescribed burning, native seed collection and seeding, and invasive plant control. Johnson Meadow Restoration efforts will include cutting and piling of trees up to 11 inches that are encroaching on meadows, burning piles, and broadcast burning of cut trees to stimulate vegetation growth. One in five piles per acre will be left as wildlife piles to provide habitat for small mammals and birds.